stage has boasted some of the finest acts to date. motivates them and how they do this undercover job of theirs. When we arrive, we see that Naomi is already there, crafting out prefab jewelry and waiting patiently for everyone else. We introduce ourselves and sit down to some idle chitchat. Jessie Sterling (affectionately known as Jessie Bean) arrives next, decked out in bright fresh clothing, carefully applied makeup, and wearing nail polish decorated sunglasses (which, I later learn, she attributes to the masterful teachings of a 65-year old artist). After ordering some coffee and a bite to eat, we wait for Cassandra Lanning, (the long-time owner and organizer of I Heart Rummage), to breeze through the door any moment and breeze she does: sporting a dark red stylized bob, cell phone in hand, and looking every part the overbooked event planner, she bursts through the café's glass doors and finally reaches our table. questions. Off the bat, I wanted to know what everyone did before joining Seattle Craft Mafia and the answers were understandably varied. the nine to five set; and Jessie Bean had been in audio engineering school, having done craft shows off and on since she was sixteen. When asked if they met through SCM, the answer is surprisingly no . . . sort of. Actually, Naomi and Cassandra couldn't agree on whether they met through SCM or I Heart Rummage. formed in Seattle since they all knew about the original, the Austin Craft Mafia. any problem with the craft takeover, they didn't show it, as they were bright with praise for Cassandra and her sheer drive and fine skills at organizing, which she describes as, ". . . very organized in a disorganized way. I know what I got going on, no one else does." she admits, "I actually work on the craft stuff, you know, every waking moment." them to fill their days with never-ending details, creative or not. When asked about inspiration, each member has more than one, although Cassandra ranks high on their lists. Energetic and effervescent Jessie Bean gives big gushing props to Austin Craft Mafia and Sparklecraft as big motivators for her while Naomi cites Beads and Beyond (WA) as a huge mentor in teaching her beading technique. However, it is Cassandra who sites the most unorthodox inspiration of them all . . . Gene Simmons of KISS. Excitedly she claims, "Gene Simmons is one hell of a businessman! That dude can sell up anything." Gene Simmons is amazing but can the extremely tall rock god of capitalism go up against the domestic world's biggest contender, Martha Stewart? Martha is king, or rather queen, in that realm. Cassandra tells me a story about IHR's vendors, Cassie Mae Chappell (Mommie Makes Roses), who had the chance to appear on The Martha Stewart Show (which, to some, is akin to receiving an OBE of art and crafts). Demonstrating how to make fake roses out of coffee filters and then water coloring them, Cassie Mae delighted many viewers across the nation and the girls back home in Seattle are very proud of her. toothpaste?! How would we make soap? How would we stay clean?" and I Heart Rummage was born and she never looked back. on three different weekends" calling it the Northwest First United Independent Craft Show. human race clean and hairless, and Naomi, well, she'll never go back to the wearisome world of nine to five. Because really, what is a world without a creative outlet? A pastel pink and blue time punch card, that's what." Natalie Portman's color-blocked red carpet look might have been shaded in boyish blue, but there's nothing depressing about this festive Jason Wu frock! The Brothers star used not-so traditional colors in a refreshing new way. The cobalt and teal combo is the perfect thing for you to try at your holiday fetes! So snag the prods below to get as glam as Nat! You don't need a makeup team to get Natalie's gorgeous smoky eyes when you splurge on Urban Decay's Eye Kit in JuJu ($32). Four shadows and travel-sized versions of eye pencils and mascara are included in the handy stash! Forgo the waist band with Jessie Beans' handmade satin appliquéé headband ($17). Beautiful Girls like you and Natalie will look gorg in a teal satin dress with ruched bow details ($42.90, Alloy.com). You don't need a bazillion dollar handbag to make a statement. For $14, grab Illamasqua's Nail Varnish in Wayward. Well, it's been a rainy May so far here in Seattle! Although, yesterday was 5th of May, which interestingly enough isn't really celebrated in Mexico... Anyways, I hope you all had a fun, SAFE time. I met today's featured seller last year while I was working the UW Street Fair for Rachael's Handmade Designs. The street fair is usually pretty large, so I was taking a break and cruising to check out other booths and checking out my fellow crafters - and guess what! Jessie Beans' accessories caught my eye! I love her work and really admire how much color she uses and what cute ideas she comes up with! She's doing the fair again this year! Go Jessie, woot woot! Hope it goes great for you! 1. What’s your name and shop name and what do you do? I am Jessie S., and I run Jessie Beans Handmade Accessories (JessieBeans.Etsy.com). I am Jessie S., and I run Jessie Beans Handmade Accessories (JessieBeans.Etsy.com). My focus is comfortable, whimsical hair accessories. I love things that are colorful, sparkly or have history behind them. I also do brooch's, wrist cuffs and some jewelry. I have a passion for ribbons and vintage rhinestones - so anything I can create using those I will make! 3. What’s the favorite part of your craft? Finding amazing vintage components to use! Since I was 5 or so, I was big into the puffy-paint sweatshirts as a child. 5. What’s your favorite thing to make? I love making my brooches and playing with piles of vintage rhinestones! 6. What kind of camera do you use to shoot? It is my roomate's photography set-up (kneehighsnpigtails.etsy.com), it is very fancy and I just know how to use the basics of it, but it works very well! 7. Who or what models your items? Usually myself or a styrofoam head, I will hopefully have some photoshoots with models soon! 8. What's the most rewarding part of running your own business? Hearing the gasps and excited reaction people have to my items when they're all displayed before them. Then watching customers try everything on! 9. What's the most challenging part of running your own business? 10. On average, how many things do you create per week? I have an off/on method. I usually create hundreds of items in a short period of time (I call it "Binge-Crafting"), then put everything away and not think about it for a while. This way everything seems more new to me at my next craft session and I can come up with fresh designs. History, vintage fashions, fun color combinations, often just the components themselves (like really beautiful ribbons or fabrics). 12. Take me through your creative process. I usually pick a specific type of item I need more of to work on (brooch's, feather headbands, hair clips etc) and compile the basic items I need for them at my work station. Then I start to look through the compartments of my crafty-storage bins to see what speaks to me. Usually there a component (often my newest find) that I HAVE to make something with immediately to base the design off of - like a decal cabochon, a ribbon, a silk flower, etc. Then I find coordinating items to go with that one item - like fabrics, ribbons, rhinestones, feathers etc. Once I compile the coordinating components, I test out a million different color combinations - usually asking my roomates repeatedly what the best combo is. Then I make a decision and start creating the finished product. After I go through this process with a few designs (what I call the "overthinking stage") and have pulled more crafty-compontents off the shelves and have a bunch of pretty things scattered all over my work area, my creative juices REALLY start flowing . At this point I can easily see that A+B+C go together well and start cranking out the designs! Then I end up with a huge mess, clean up and put away everything and start the whole process over again. 13. What is your best advice to blossoming crafters? Take classes, learn as much as you can and never stop experimenting or growing as an artist! When I compare what I made 6 years ago when I started selling my crafts to what I do now, the evolution is just amazing! If you find what you're currently doing isn't working, there is always something else to move on to! Thanks Jessie! I sure do love your pieces! Can't wait to come harass you (and shop of course!) at your booth at the fair this year!! Some days my hair looks dull. I can't really rock the hat look. Sometimes you need that one accessory that pulls your whole look together. I am a big fan of headbands, especially the wide ones. I stumbled across a shop on etsy that sells amazing ones. Jessiebeans has a huge variety of colorful, fun headbands that are full of personality. I love the beautiful lace and ribbon that she puts on them. Some have flowers, some have cameos, and one even features a fleur de lis. What I like most of all are the pretty cameos that she decorates them with. This turquoise headband is my current favorite. I love the way the cameo brings the piece together with the gold trimming around it. It's such a neat way to wear a cameo! 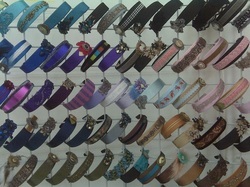 You can check out these headbands and more at jessiebeans's etsy shop! Last month I reported on some cool hair accessories that my obsessive internet-ing had turned up. It would appear that trendy, fun hair things are not going anywhere anytime soon. Currently, I am obsessed with these Bumble & Bumble Buttonbands ($15). I saw them at the salon and (feigning admirable amounts of restraint) passed on the impulse buy. Subsequently, I've been regretting that choice ever since. Honestly, how cute is the indigo-trimmed ocean blue color? Or the violet-trimmed black with their little coordinating button details? The answer: freaking adorable. Plus, they are designed to be used alone or as a base for wildly creative embellishment. Watch the video to see an impressive amount of creativity inspired by these little guys. Anthropologie often has very beautiful hair accessories. Unfortunately, they often run in the really ridiculous $30-50 range. 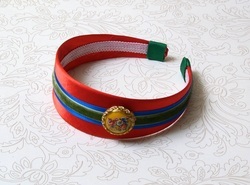 However, the very pretty Teavaro Headband comes in at less than $20. Delicate clusters of black pearls nestling on distressed chiffon petals strike that perfect balance of polished but unfussy. The subdued blue palette would be very pretty on all hair colors. I've been completely obsessed with the etsy shop, Jessie Beans, since randomly meeting the owner/creator at a local fabric store. She was wearing one of her creations and, when I complimented it, she gave me the address for the website. Unlike most of Anthropologie's offerings, Jessie Beans' amazing hair accessories are sold at ridiculously affordable prices. This one, with white ostrich feathers ($20) was exactly the kind of thing I searched for (unsuccessfully) for my wedding. But, even if formal nuptials are not on the agenda, she has plenty other offerings with intricate beading, beautiful pendant cameos and even more feathers. All are individually made by hand and perfectly executed without being overly done or cheesy. They are as beautiful, or even more so, than many Anthropologie hair accessories at 1/3-1/2 the price. Whether ornate or quietly simple, Jessie Beans' headbands have the added bonus of being completely one of a kind and unique. And how can you put a price on originality?